BREAKING NEWS! WE NOW OFFER FREE DELIVERY ON ALL TRI FOLD LEAFLETS OVER £30! Our production machine for this product is under maintenance. All orders will be delivered between 5 and 7 days later than the stated delivery time. 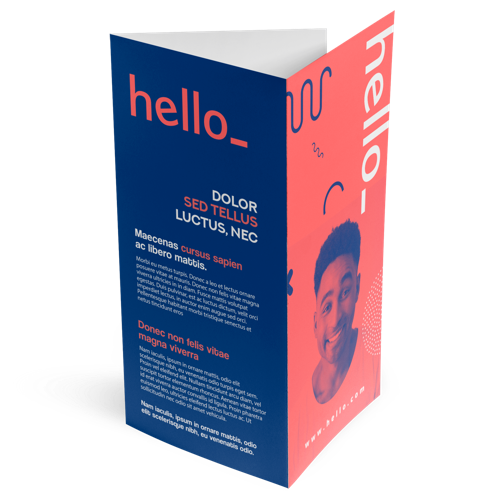 Triple your attention with Helloprint's Tri-fold Leaflets! Compliment your business by printing your logo and discounts in full colour with any of the stock sizes and luxe finishing options available. Take your customers and clients on a journey of enticing offers and memorable moments that are still to come! Not sure if your leaflet is print ready? Have a quick look through our artwork guides for more info. In a time crunch? Don't stress, we deliver super fast! Will my Tri Fold Leaflets be printed on both sides? 170gsm silk is a sturdy material, which is slightly matt. It will create a professional look and is perfect for a folded leaflets with mainly text. Offset printing is used by big traditional presses using so called "batched sheets". By combining orders from several customers offset printing, especially for high printruns, the lowest price available. Digital printing we use professional HP indigo printers almost directly after receiving your order. Digital printing is often cheaper for low printruns. The quality is practically the same. Based on price and quality we select the best possible printtechnique. Looking for a specific printing technique for your artwork, please contact our customer support. Tri Fold Leaflets are one of the most ordered and most popular marketing materials from our range. A Tri Fold Leaflets is a folded sheet of paper that can be printed completely according your needs and wishes. For the delivery of your tri fold leaflets we use multiple carriers. Because of the highest reliability, in most cases we use UPS or DPD. The tri fold leaflets that is chosen in most cases can be selected via our website. Yes, Tri Fold Leaflets will be printed on both sides.